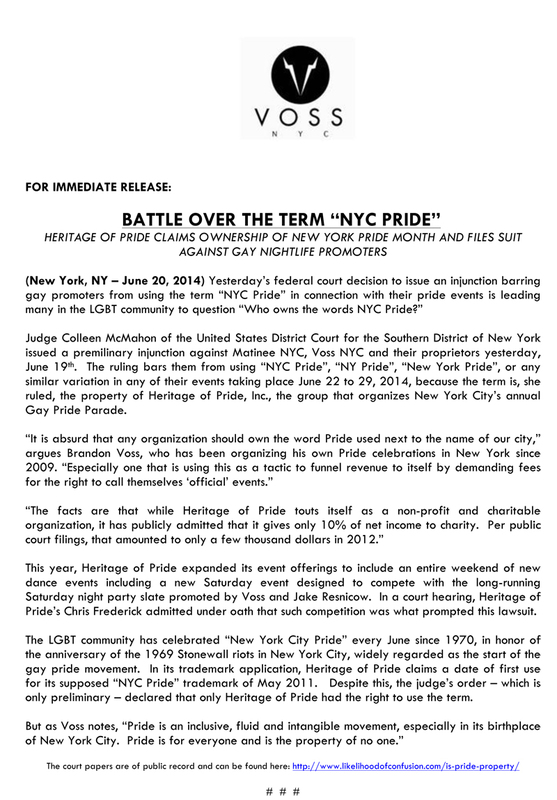 Heritage Of Pride, which organizes the gay parade in NYC, has copyrighted "nyc pride", ny pride", "nyc gay pride" and every other configuration of words connecting to gay pride in NYC. They aren't concerned with some group forming a competing pride parade. But HOP is doing official nightlife events and suing promoters like my sometime boss Brandon L Voss﻿ for including NYC Pride on invites for events the same night. Not for including Heritage Of Pride--that isn't on Brandon's invites. Nor do the invites that promoters like Brandon are being sued for claim to be official pride events. Just NYC gay pride. I don't feel Heritage Of Pride has the right to do this. Many people don't attend the pride parade and prefer to go out to clubs instead--which traditionally has been a big weekend for the struggling club business. And gay pride should not be copyrightable. Doesn't that belong to all of GLBT? With straight body-builders hired to dance on floats for Red Bull and Sprint to entertain the straights watching the parade, could the parade get any more commercial and money-grubbing--especially for a "non-profit" like Heritage Of Pride? I sometimes work for Brandon, but not actually at the moment. But I'd defend anyone's right to use NYC Gay Pride on an invite. This is kind of like Monsanto copyrighting corn and suing the state of Vermont--as it currently is.